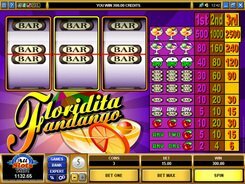 This Microgaming-powered slot has 5 reels and 30 paylines, with its theme revolving around a casino theme. 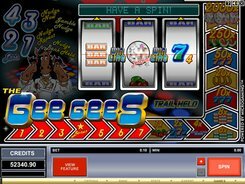 To fit the topic, the symbols incorporate an array of themed images such as dice, chips, a whiskey glass for casino visitors, a lovely table game dealer, etc; these are joined by standard playing card values from 9 through Ace. 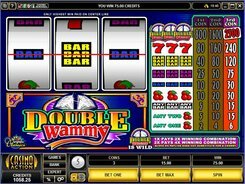 Wagering up to 5 coins per line at $0.01 to $1 each, you can make a maximum bet of $150 per spin. 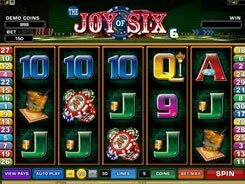 Joy of Six has a basic set of bonus features including wilds, scatters and a free spins round. A wild is depicted by the red dice that substitutes for other symbols. 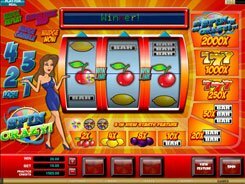 During a free spins feature activated by three or more scattered Ladies, a wild Dice rolls onto the reels field and reveals a random face value from 1 to 6. Then, all winnings with a wild as a substitute (if any) are multiplied by the face value showed on that dice. 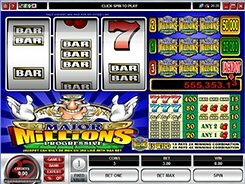 The top prize you can pocket in the Joy of Six slot is x7500 if five scatters land anywhere on the reels.